At Station Square Dental, we understand that dental emergencies can happen at any time. 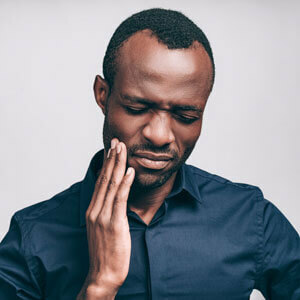 Understandably, these situations can be distressing, especially if you’ve lost a tooth, or are experiencing severe dental pain and discomfort. This is why we try to keep some space available in our appointment books every day for patients requiring emergency dental treatments. If you’re in need of urgent attention, our caring and friendly team will make you a priority and try to help in any way possible. Often, a patient may be hesitant to label their concern as a dental emergency, and therefore might not seek the medical attention they need immediately. It’s important to familiarise yourself with the following common dental emergencies, in case you or your loved ones find yourselves in the following situations. Toothache and Swelling: Swelling is often caused by an infection known as an abscess. Aside from swelling, symptoms of a dental abscess include severe pain, tenderness to the touch and throbbing pain. Your cheek might also feel warm. If you have any swelling, contact us immediately, as there can be serious consequences such as septicaemia (bacterial infection of the blood). Once we’ve given you the treatment you need, it should quickly start to reduce. We may also prescribe antibiotics to soothe any pain. Knocked-Out Teeth: Injury to your mouth or jaw may cause a tooth to be knocked-out entirely from its socket. If this happens, it’s important not to panic. If you visit our practice with the tooth immediately, we may be able to save it. If you can see the knocked-out tooth, pick the tooth up by the crown, give it a gentle clean with milk or saliva and place it back in the socket (without trying to force it in place). If you’re unable to do this, place the tooth in a container of milk or the side of your cheek and bring it with you to Station Square Dental. Fractured Teeth and Loose Fillings: A fractured tooth or loose filling can cause exposure to the nerve, resulting in sensitivity and discomfort. Exposed sharp edges can also cut your tongue or cheek. We can use our advanced CEREC technology to provide immediate relief. Missing Crowns or Veneers: If you’ve lost a crown or veneer, we can re-cement it in no time at Station Square Dental. If you’ve lost it entirely, we can also create and fit a new one in just one day using our CEREC technology. In need of emergency dental help in Oakleigh? Please contact our professional team as soon as possible to receive the priority treatment you require. We’re here to help!